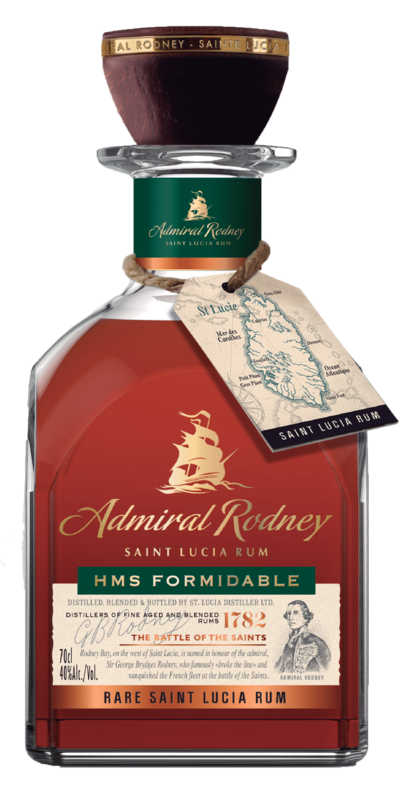 Admiral Rodney HMS Formidable Rum | Rare St. Lucia Rum | Super Premium Caribbean Rum — Emporia Brands Ltd. Launched in August 1777 HMS Formidable was Admiral Rodney’s flagship in the famous Battle of the Saints. Formidable was in the centre of the British fleet and took advantage of a sudden wind change to “break the line” and sail into the French fleet unleashing her 98 guns on Admiral de Grasse’s ships. Fighting with gusto and courage Formidable’s gallantry has inspired us to create an exceptional rum that celebrates valour, honor and service. HMS Formidable contains rums aged in American white oak Bourbon casks with the base distillates being aged for a minimum of 9 - 12 years in tropical heat which significantly speeds up the maturation.